Denial – What does it feel like? I had an interesting exchange with fellow twitterite and blogger Medical Skeptic today. 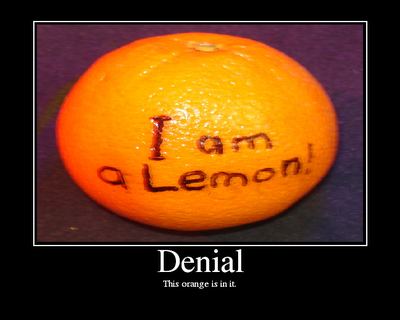 The topic was denial on the part of the terminally ill. Is it something you can decide to stop? Does that mean it’s a choice? It is a normative response, but was it conditioned by a “death-denying society”? With a view to furthering that conversation, I am going to look back at my most recent bout of denial, earlier this year. I wrote a little about it back in July. What is denial? What function does it serve? One way of understanding this defense mechanism is that it is one of the ways our psyche protects itself from unbearable pain or anxiety. It is a sort of reflex, like jerking your hand away from the hot oven or covering your ears when there is an enormously loud noise. It isn’t voluntary and it isn’t logical. I already knew I had cancer; I already knew I had mets, that I was in the “incurable” category. Years before, long before I had my first cancer diagnosis, I had given thought to my end of life plans. Seeing people in ICU and reading case reports convinced me long ago that I do not want any extraordinary measures. On the other side of things, I am a spiritual and religious woman. In one sense, every day of my life helps me prepare for my death. I am not afraid of it. So what gives? Why would I, of all people, go into radical denial at the news of a further progression of my disease? Any soldiers out there? It’s one thing to practice on the range, to participate in military exercises, even live fire exercises. It is an entirely different thing to be on the field of battle with people out there doing their level best to kill you. Any doctors or nurses? It’s one thing to pound the daylights out of a sophisticated plastic doll (“Annie, can you breathe?”) and an entirely different matter to try to bring a dead person back to life while incidentally breaking their ribs. The metaphors are many. The point is that there is a real difference between head knowledge and gut knowledge. I believe that denial as a defense mechanism exists as a cushion to protect us while the knowledge moves down from head to gut. While I was in denial I was frightened and I felt a little frantic. The various alternative scenarios that I was proposing seemed like real possibilities to me at the time. In the natural course of things my own psychic integrity brought me gently along to the place where I could accept the new reality: there are lesions in my skull now. Denial protected me until I was ready to take the next step toward acceptance and action. Thank you for your essay, it is a valuable contribution and hopefully will help some from devolving into the potentially infinite regress of ‘denying denial’. Information is frequently misunderstood, incomplete, or simply wrong. The huge debates currently raging about mammography, psa screening, heart stents vs. Rxs, etc testify to the uncertainty of much medical theory and diagnosis. Suspending judgement and seriously questioning new information is valuable. ‘Denial’ is valuable, if acted upon and used to get second opinions, research the diagnosis, etc. Denial only becomes dysfunctional when not eventually acted upon and becomes a rigid part of one’s character, resistance to new knowledge and changes in one’s condition. I look forward to future discussion. Denial? I’m not absolutely comfortable with the term. In my own situation I think it was protective scenario-building that allowed me to create a place where my whirling imagination could rest until the next bit of black news came along. It wasn’t so much denial as a wilful acceptance of a more positive scenario than the facts justified. One of the blessings/curses of being widely read and surrouded by supposedly wise and/or holy people is that if I looked long enough and presented the situation in the right way, I could find someone (or read someone) who agreed with me. It wasn’t until my explanations failed radically that I became willing to listen – better yet, to “hear” messages that begin a journey of re-integration. I have SO not arrived but I grow closer some days. I think you described it well as a protective mechanism. It allowed me to acknowledge that I was indeed ill without giving in to how sick I was. It took years of reading my pathology reports before I realized the truth about how many tumors I had and how large they were and understood the graveness of my prognosis. My brain was blocking the information until it was safe to process it. I don’t think I chose to be in denial. I think it just happened. Totally agree with you. I had major denial when first diagnosed with stage I prostate cancer. Oddly enough, there was no denial a few years later when it metastasized and was diagnosed as stage IV. I found this post very timely. I’ve been working on a post about how to get to acceptance and getting past denial is a critical first step. Thank you for sharing – I am of the point of view that denial is a ‘stage’ and that you can either work through it or ‘get stuck’. Much like processing grief – one can choose to move through the pain, albeit at different paces, or remain in a place which is uncomfortable for them and all those around them. I guess for every person it differs as it also depends on their psyche and emotional development, and how they have coped with stress and the unexpected throughout their life. There are times I have been able to ‘guesstimate’ (fairly accurately) the age of a persons emotional trauma, or the start of their drug habit, by their emotional development. What a great response. Thank you, everyone. Although I started this blog for myself, it’s become a real source of support to read the comments.